1. In your Kaltura account, click on the 'Create' button. 2. From among the possible ones, choose 'Create Live Stream Entry'. Kaltura will offer you a publishing point for your live video stream. 3. Define a name for this new video stream that you will create. Make sure you have chosen the type 'Kaltura Live Streaming'. 4. In the entries list of your account in Kaltura, access the edition of the live video stream that you have just created. In the 'Live Stream' section, copy the RTMP code and the stream key associated with this publication point. 5. 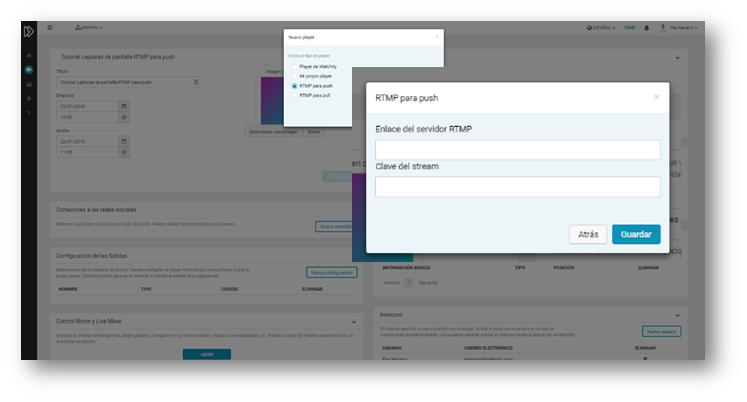 In the configuration of your Live Broadcast in Watchity, add an output "RTMP for push". Paste there the RTMP code and the transmission key obtained in the edition of the publication point in Kaltura. 6. Once you start the transmission in Watchity, at your Kaltura publishing point you will receive a preview of the content that is being distributed from Watchity.